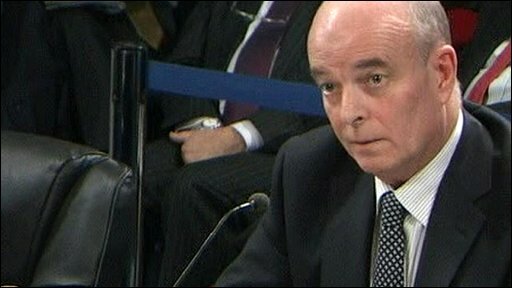 Sir John Scarlett: "There was no conscious intention to manipulate the language"
Ex-spy chief Sir John Scarlett has told the Iraq war inquiry there was "no conscious intention" to manipulate information about Iraq's weapons. He denied being under pressure to "firm up" the September 2002 dossier which contained the claim Iraq could use WMD within 45 minutes of Saddam's order. But he said it would have been "better" to have made clear it referred to battlefield munitions not missiles. He was not asked about an MP's claim a taxi driver was the claim's source. Tory MP Adam Holloway published a report on Tuesday saying advice casting doubt on the 45-minute claim was "ignored", but Sir John was not asked about this. The infamous September 2002 dossier included the now discredited claim that Iraq could deploy weapons of mass destruction within 45 minutes of an order being given. It was at the heart of the row between the government and the BBC which culminated in the death of government weapons expert Dr David Kelly. Sir John, who was in charge of the dossier, said it was produced in good faith: "There was absolutely no conscious intention to manipulate the language or to obfuscate or to create a misunderstanding as to what this might refer to." Sir John, who until recently was head of MI6, was chairman of the Joint Intelligence Committee when it produced the controversial dossier spelling out the case for military action against Iraq. Sir John defended the dossier but said it should have stated the 45-minute claim referred to battlefield munitions not ballistic missiles to avoid the information "getting lost in translation". The evidence presented by Sir John Scarlett was keenly awaited. Unusually, every seat in the public gallery was occupied today. The former chairman of the Joint Intelligence Committee was driven discreetly into the QEII Conference Centre through a side entrance. Inside the inquiry room, there were to be no startling revelations. Sir John reinforced the point that intelligence from Saddam Hussein's Iraq was limited and "very difficult" to obtain. He firmly rejected the suggestion that there had been pressure to firm up the language in the controversial 2002 dossier on WMD. He went some way to distance himself from Tony Blair's foreword. Sir John said he had made small corrections, but he insisted it had been Mr Blair's wording. There is the intriguing prospect of more evidence being given by Sir John at future sessions, although the chairman of the inquiry, Sir John Chilcot, made clear this evidence would be heard in private. During the 90 minute hearing he was not asked about where the 45 minute claim intelligence came from - although inquiry chairman Sir John Chilcot said at the end of the session the ex-spy chief would be giving evidence again behind closed doors. Sir John Scarlett also told the inquiry that, on 19 March 2003 - the day before the invasion - the Joint Intelligence Committee discussed intelligence suggesting Iraq had disassembled its chemical weapons capability and might find it "difficult" to reconstitute it. However, he said this was not new information and the committee did not revise its view that Iraq did possess chemical and biological weapons and had the capacity to use them in battlefield munitions. He said that the prime minister and other ministers were informed of its conclusions. Discussing the general reliability of intelligence ahead of the war, he said the nature of Iraqi society - where policy revolved around the "whims and personality" of Saddam Hussein - meant it was difficult to produce intelligence, particular about secretive weapons programmes. He said all intelligence sources, particularly those from opposition and exile groups, were treated with "caution". He said "significant" assessments in August and September 2002 suggested Saddam was accelerating both his biological and chemical weapons programmes and had "intent" to use them if attacked - reports that continued to influence JIC thinking in the run-up to war. Ahead of Sir John's appearance a Commons Defence Committee member, Tory MP Adam Holloway claimed military advice was matched to the "prevailing political wind" in the run-up to the invasion. Mr Holloway, the MP for Gravesham and a former officer in the Grenadier Guards, published his paper The Failure of British Political and Military Leadership through First Defence, the centre-right think-tank he chairs. The cursory level of questioning undertaken in public - and the announcement that further appearances will be behind closed doors - is deeply disappointing. In it, he said the 45-minute claim arose because British intelligence was "squeezing" agents in Iraq for information, under pressure from Downing Street to back up its case that Iraq had weapons of mass destruction. "The provenance of this information was never questioned in detail until after the Iraq invasion, when it became apparent that something was wrong," he said. "In the end it turned out that the information was not credible, it had originated from an emigre taxi driver on the Iraqi-Jordanian border, who had remembered an overheard conversation in the back of his cab a full two years earlier." Mr Holloway stated that an intelligence analyst had at the time flagged up - via a footnote - that the claims were "demonstrably untrue". "Despite this glaring factual inaccuracy... the report was characterised as reliable," he said. The government has yet to respond to his claims. The inquiry chairman said it would deal with the MP's claim where "relevant" in the inquiry but it was not specifically a "matter" for Tuesday's inquiry hearing. The row between the BBC and the government came after a report suggesting the dossier had been "sexed up" by Downing Street against the wishes of the intelligence services and that the 45-minute claim was included even though the government "probably knew" it was wrong. The Hutton Inquiry into the death of the BBC's source - Dr David Kelly - ruled that the BBC report's claims were "unfounded" because the 45 minute claim was based on a report which the Secret Intelligence Service "regarded as reliable". It was not until the following year's Butler inquiry into intelligence about Iraq's weapons capability in 2004 that it emerged that the 45-minute claim had come "third-hand", through an established source and a second link in the reporting chain from the original Iraqi military source. Lord Butler concluded the limitations of the intelligence were not "made sufficiently clear", that important caveats had been removed and that the 45 minutes claim was "unsubstantiated" and should not have been included without clarification. The then Foreign Secretary Jack Straw told MPs that MI6 had withdrawn the claim in October 2004. Liberal Democrat foreign affairs spokesman Edward Davey said Sir John Scarlett's evidence "stretches credibility". He added: "The cursory level of questioning undertaken in public - and the announcement that further appearances will be behind closed doors - is deeply disappointing. It looks like the Chilcot Inquiry may have failed its first test on transparency."